While the title of this journal entry may induce memories of a classic hair band song (cue Whitesnake circa 1987), this post does not serve as an introduction to a blog about Aqua Net and David Coverdale. No, in fact, it’s Day #1 of a fresh new story: Bringing up Buddhas, or at least trying to bring up Buddhas, after all this family is very much a transition in progress. The pages of this blog will document the real-time spiritual evolution of a my family as we transition from Christianity to Buddhism. We are a family of 7: My husband, who is not sure he is down with this whole thing but thinks Buddha rocks; my step-daughter, who is away at college and doesn’t have to deal with any of this; my almost 8 year old girl, who can already quote me the Four Noble Truths and is excited to get this party started; my 6 year old baby girl, who loves Jesus and is more interested in Littlest Pet Shops than meditating on a pillow; my 3 1/2 year old son, who talks as fast as he scooters and could use a little Zen in his life; and my dog, Rufus, who well… is… a dog. Since I am the ring leader of this group of misfits, I will share my own simple history with religion. 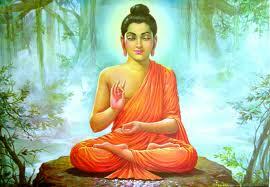 I have not been a Buddhist for very long. Like most New Englanders, I was born into a Christian family and raised as such. In my early 30s I became a curious seeker, studying metaphysics, new age philosophy and chakras… numerology, meditation and Reiki… crystals, past life therapy and psychic energy. In January of 2011, I began to overshare my exciting spirity discoveries via my blog Everything Old is New (Age) Again. I suppose it was only time until I began the transition to Buddhism. It was in that moment that I knew I did not belong. (Read my other blog and you’ll understand why.) I then stumbled through the church’s heavy oak doors, tripped over Virgin Mary’s pregnant belly (or was that my own?) and slid straight down the enormous, static mountain of “thou shalt nots”. I remember thinking, What now? How will my kids know God? Who am I if I can’t be a Christian? How will I decorate my home in December? Well, years of new age study have provided me with a good sense of who I am spiritually. And after much consideration and examination, I realize clearly and confidently that, though I do love Jesus, I am certainly not a Christian. I thought maybe I’d just remain a spiritual-not-religious type for the rest of my life, but as I read more about Buddhism, I connected more deeply with the teachings of the Buddha. And finally I surrendered to what my heart was telling me was right. Declaring to myself and to others that I am a Buddhist helps me feel lighter, more honest, more myself. And I am grateful. Buddhism is more a philosophy than a religion. It’s a way of life. Buddhism is a practice. And thanks to modern monks and teachers, Buddhism has evolved through the years in order to relate to modern practitioners and provide its community with philosophy and psychology that can enhance life and pacify the earth. As much as I have read and learned about Buddhism, there is still soooooooo much to know. I walk into my future with a “Beginner’s Mind”, a mind that does not yet have an impression. And I’m excited to overshare everything I learn along the way. Bits of Christianity will remain in my family’s spiritual development, of course. And I will continue to melt over gospel music and sing Oh Holy Night! proudly and loudly on Jesus’ birthday. You can’t take the church out of the girl, after all. Plus, as I mentioned my daughter SG has always had a special affinity for Jesus and I’ll continue to nurture that relationship and encourage her to follow her heart, wherever it leads her. We’ll just figure it all out as we go along. East meets west, yo. I imagine this transition will be very slow and full of blunder. So please bear with me. to connect with other moms and dads who are also bringing up Buddhas. to refine a reasonable Buddhist practice for my children. to shed light on Buddhism for others who are Bu-curious. to learn from you, so pretty please post comments as much as you can. that you (yes, you) will “like” and “share” this blog with others to help connect a community of peace-seeking parents. to publish a book and/or create a regular new age-y broadcast that will help folks build mindfulness in New England. I love love love New England and want to help rid this part of the country of its karmic baggage. (Salem Witch Trials much?) With your help and support I know I can do that. I imagine that many (most) of you are my family, friends and neighbors, which means you are scanning these words from computers, tablets and smart phones around the globe. I am totally and completely in love with your friendships and kinships and mate-ships. And I am grateful for the lifetime of support you’ve given me. I am incredibly blessed to have family and friends like you. Yes, you. I couldn’t do this alone. I receive your support with enormous love and return it to you infinitely with sincerity and depth. p.s. If you would like to get blog updates or find an additional way to connect with like-minded people, please “like” my Facebook page “Everything Old is New Age Again” by clicking the link below. Or just “like” it b/c you like me. 🙂 Peace!